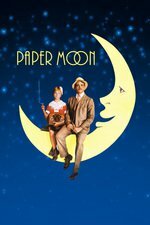 Roger Ebert: “Paper Moon” doesn’t come off, then, as a homage to earlier beloved directors and styles (as Bogdanovich’s “What’s Up, Doc?” did - and his “The Last Picture Show,” to a smaller extent). No, it achieves something quite different: a period piece that uses generic conventions only when they apply, so that we see the Depression through the eyes of characters who are allowed to be individuals. Whatever Addie and Moses do in this movie, we have the feeling it’s because they want to (or have to) and not that the ghost of some 1930s screenwriter is prompting them. NYTimes: Laszlo Kovacs's black-and-white photography doesn't recall some nice little studio picture but "The Grapes of Wrath" with its gigantic, sorrowful landscapes. Also, Bogdanovich's use of prairie faces in subsidiary roles keeps nudging the movie into a category in which it is not at all comfortable. The film never makes up its mind whether it wants to be an instant antique or a comment on one. I suspect these reservations will strike many people as superfluous since "Paper Moon" also contains two first-class performances by O'Neal and his 9-year-old daughter. The actor moves easily between his roles as star and as straight-man for Tatum, a charming, tightlipped little girl who has — and this may well sound absurd—the quality of a teeny-weeny Joanne Woodward. I also very much liked Madeline Kahn's very broad characterization as a carnival kootch girl and Burton Gilliam's as a small-town lecher. The late Polly Platt is the real reason this film and Last Picture Show are so good. Certainly nothing else in Bogdonavich's career even comes close. This was the first movie we watched on our brand-new enormous hi-def TV some weeks ago. My kids didn't want to watch it, because they didn't think it sounded good. I wasn't sure it was the right choice because we had wanted something that would really show off the great new picture quality. But they'd veto'd everything else I suggested, and finally I said, "I'm putting this on and if you hate it we can turn it off." They loved it. We all loved it. And the gorgeous visuals were fantastic for showing off our new TV. I'd seen this when I was young and liked it, but you never know how something like that is going to hold up. This held up so well. We joke all the time about running cons on each other now. We were playing a board game the other night where money exchanged hands, and it amused us to pretend we were going to run the, "Can you break a five...OK, now I'll give you these five back and you give me a ten..." scam. Tatum O'Neal was an early crush for me. Not in this, but in The Bad News Bears and Little Darlings. I love this movie. I've loved it ever since I was a kid and I love how it's still good now. I like that Addie is troubled and sullen and more than happy to fall into the life of a con artist. As a child, it was refreshing to see a girl who got to be those things. Plus, Madeline Kahn in this movie. I am not kidding when I say I think of her monologue as Trixie daily. What a beautiful piece of acting. This movie is maybe the only major motion picture to be shot in my hometown of St. Joseph, Missouri, and boy, did I hear a lot about it growing up in St. Joe. Because of that instinctive prejudice kids have against anything the older generation says is good, I didn't watch Paper Moon until I was well into my 30s. And I could not believe how legitimately great it is. Everything about it is great! Another vote for this movie. I love it. The utterly gorgeous photography alone makes it worth a watch. A few years ago I saw this via the Los Angeles Conservancy's Last Remaining Seats program. Peter Bogdanovich talked beforehand, and he told a story about how he decides he wants to name it Paper Moon after the song, but the studio doesn't like the name. Bogdanovich: Orson, I've got this idea for a movie, and I have a name that I like, but the studio doesn't like it, and I want to get your thoughts on it. Welles: That's the best title I've heard in my entire life! Forget the movie; just release that title! According to reports, Kahn really, really did not want to do that Monologue, she fought with the director right up until they had to shoot it. It's now one of the most famous things she ever did. anyway I too love this movie. Like with all O'Neal roles, I legit believe he's that venal and contemptable and I love the vision of the American west here, dusty and isolated and empty. The movie feels hit and sticky, full of that period desperation. I didn't realize Kahn didn't want to do that monologue -- but it makes sense, honestly, in the end. It feels very raw and vulnerable. This is one of my favorite movies, and I read the book as well, which is also very good. I love black and white movies, and this one is so beautifully shot. The music is perfect and...man, it's just so darn fantastic.